Not only does our gorgeous Beef come from the Elliots, our fabulous organic goat and lamb come from the same high animal welfare farm. 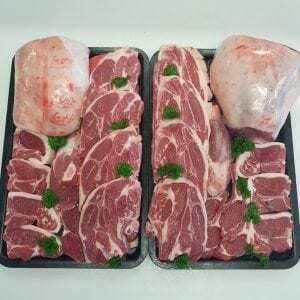 Lamb is certainly in the Top Ten most commonly bought items in-store, which goes to show our customers (You ) love our lamb just as much as we do! Carve the meat against the grain with a sharp knife to keep the meat as tender as possible. Making small cuts into the surface of the skin and rubbing salt and pepper as well as stuffing sprigs of herbs and cloves of garlic will keep the natural flavour of the meat and will add extra layers of flavour. With the leftover fat and juice, use this to make a gravy or sauce. Traditional pairings are mint, rosemary, parsley, garlic, onions, wine, curry, polenta, artichokes, peas and root vegetable. A more modern pairing is yoghurt and many different fusions such as Tzatziki, or with mint and garlic mixed through or even a dash of curry powder in the yoghurt can make for a subtle sauce or dressing over the lamb. Marinade for 24 hours and for larger cuts 48 hours for maximum tenderness. Got any tips and tricks youd like to add to the list? Let us know!